"From storing the stroller to generous outdoor space, Upper Beach suites by Streetcar Developments cater to young urbanites with kids. 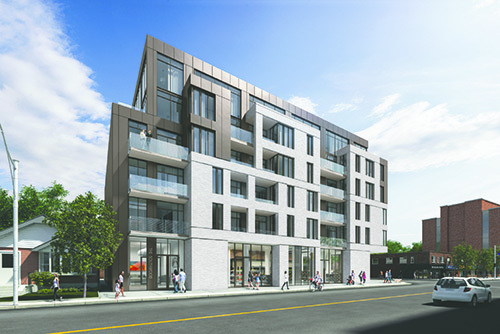 A new midrise condo in the Upper Beach neighbourhood is putting family living at the forefront. The six-storey Southwood by Streetcar Developments, at Kingston Rd. and Southwood Dr., is one of the first condominiums targeted specifically to families, and has been designed with their needs in mind. The 45-unit building opens February 22 and will offer a variety of suites, from one- to three-bedrooms. The building will also appeal to buyers downsizing from houses. “We are catering to two kinds of buyers — the empty nester who lives in the Beach or Upper Beach and doesn’t want a house anymore but wants to stay in the neighbourhood, and the other group is downtown young couples with babies or young children,” says Jeanhy Shim, president of research and consulting firm Housing Lab Toronto and a consultant on the Streetcar project. “There are a lot of young, downtown buyers living in shoebox-sized units whose life circumstances have changed. They may have one small child or are thinking of having kids and thinking ahead to where their child will go to school. “It’s the first building I can think of that’s actively gone after the family downtown demographic,” says Shim, who has been raising her own young daughter in a condo and is about to embark on an in-depth study of downtown urban family housing needs. At a recent roundtable discussion held at the Star, several major condo developers identified condo family living as an emerging trend and saw a need for larger units and more amenities to accommodate them. The developers see an increasing number of people staying in the downtown rather than moving to the suburbs after they have kids, as they don’t want to spend a lot of time commuting."